Needlepoint is traditionally made with wool, cotton or silk yarns and threads, but a wide range of other materials can work if you feel like being a bit more adventurous. The important thing is that whatever you chose is long and strong enough to withstand being pulled through stiff canvas mesh many times, since that is how needlepoint work is done. Generally speaking, yarns and threads with short fluffy fibres will not work well for needlepoint, since they have a tendency to break or become fuzzy when pulled through the mesh canvas over and over again. In this group of unsuitable choices, we find many that are intended to be used for knitting or crochet. The most common yarn for needlepoint is wool yarn, since it is durable, colourfast and easy to work with. It is usually a bit more expensive than cotton, but much less expensive than silk. For the novice, we recommend sticking to yarns and threads specifically sold for needlepoint work. Also, when you try a new one, ideally do a little one-inch sample on a piece of scrap canvas to find out if your choice is suitable for the stitch and mesh size you want to use for this specific project. It is best to get the bad news early, before you have put a lot of money into buying something that turns out to be unsuitable for what you had in mind. Needlepoint yarns and threads are typically sold by the skein or by the card. Persian wool yarn and tapestry wool yarn is also available by length or by weight, at least in some shops, giving you the option of buying the exact amount that you want and not ending up with a lot of left-overs. If you need to buy multiple skeins or cards, make sure they are all from the same dye lot, since the exact hue can vary from one lot to the next, even when the products carry identical labels. Persian wool yarn is an extremely popular choice for needlepoint and there are hundreds of hues to chose among in the trade. 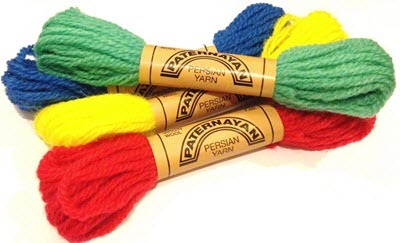 Persian wool yarn intended for needlepoint work will typically be spun as a single 3-ply thread. The three plies can be separated into individual strands, which is convenient if there are parts of the design where you need to carry out fine stitching. On large mesh canvas, using all three plies together will work best, as the 3-ply thread has the same volume as tapestry wool yarn. Crewel wool yarn is of course chiefly associated with Crewel embroidery, but is sometimes also used for needlepoint work. 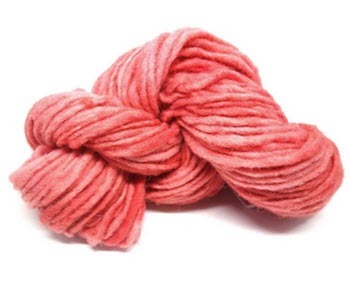 Crewel wool yarn is a fine weight yarn and using it feels a bit similar to using just 1 ply of Persian wool yarn. Among needlepointer, crewel wool yarn is typically selected for blending and detailed work, especially on #18-#22 mesh single thread canvases. If the mesh size is larger, you will probably need to combine two or more strands of crewel yarn to achieve proper coverage. 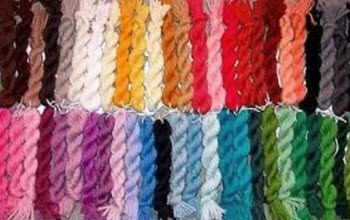 Tapestry wool yarn for needlepoint consists of a single strand thread that can not be easily separated into finer parts. In the trade, it is typically sold in the form of 8.8-yard skeins. Finding hanks is more difficult, but some well-assorted shops do have them. The tapestry wool yarn thread will provide proper coverage for a #10 mono needlepoint canvas. If the mesh size is larger than that, you will probably need to put at last two strands in the needle to get adequate coverage. 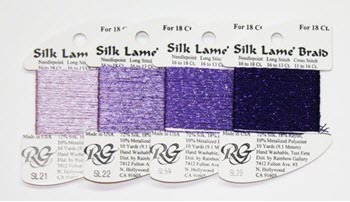 Compared to wool and cotton, silk thread tend to be expensive and much more delicate. It is more complicated to work with, partly because of its delicacy and partly because silk strands have a tendency to cling to each other, and you might need to use a laying tool or trolley needle to manage the boisterous silk while working it. Still, for many skilled needlepointers, both the cost and the effort are totally worth it, since silk can yield such an amazingly beautiful end result. Silk is also a great way to achieve special details on needlepoint designs, such as especially rich and shiny stars on a winter’s night sky or the Christmas tree ornaments on a holiday themed creation. Cotton thread for needlepoint is typically spun as individual strands and sold in groups of at least four. Depending on what level of coverage you need, each group can be pulled apart or “stripped” and put back together again, giving you a high degree of flexibility. Cotton tends to be cheaper than wool and much cheaper than silk. 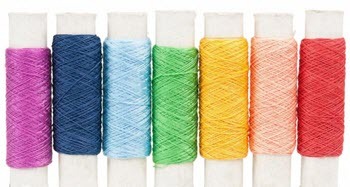 Cotton is available in various qualities and textures, and interesting effects can be achieved by combining two or more different cotton threads in the same piece of work, e.g. by letting pearl cotton contrast against rougher cotton. Metallics and other novelty threads and fibres can be successfully used for needlepoint, as long as you chose wisely and know what to expect from the material, both when it comes to working with it and for how it will hold up against wear and tear on the finished product. Some less durable materials will work excellent for purely decorative wall art, but are not recommended for products such as upholstery and garnments. Ribbons, cords, leather strips, metallics, unusual plant fibres – the list is almost endless when it comes to things that may be incorporated in fanciful needlepoint designs as long as you pick a suitable pattern, canvas and needle.